Our riding mower has been overworked this season. It was a wet spring and a wet summer, and I mowed a lot. 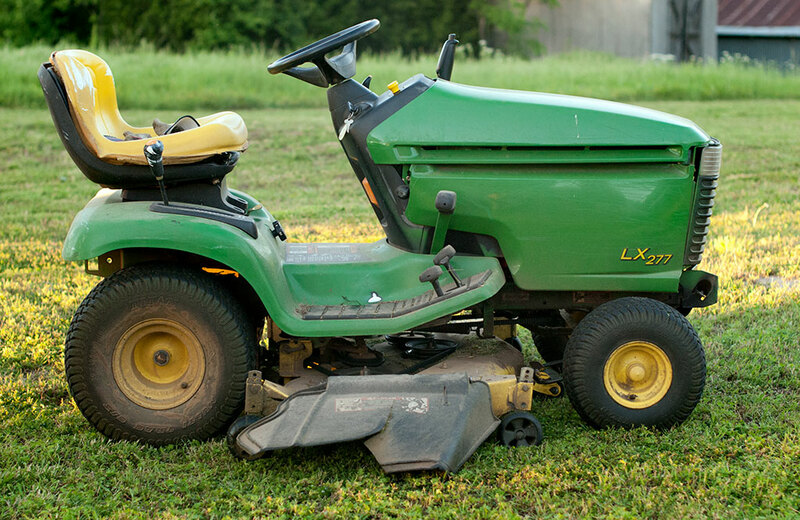 Even at the start of spring, the blades in the John Deere lawn tractor needed to be sharpened or changed, but the actual mowing always took precedence. I chopped about 10 pounds of caked-on grass from the underside of the mower deck. There’s no easy way to accomplish this without removing the deck from the mower. The first two blade’s bolts came off fairly easily. 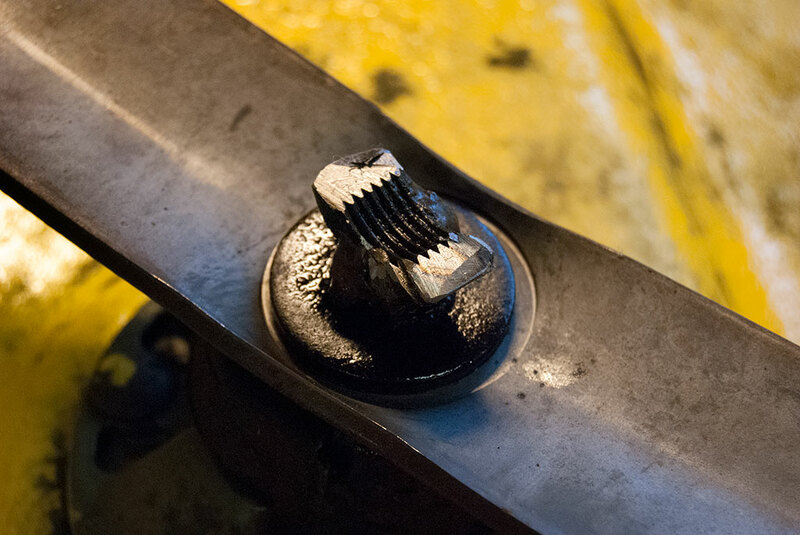 To remove the third blade, however, require welding a huge nut to it and using it to turn the bolt, which we discovered was quite rusted. 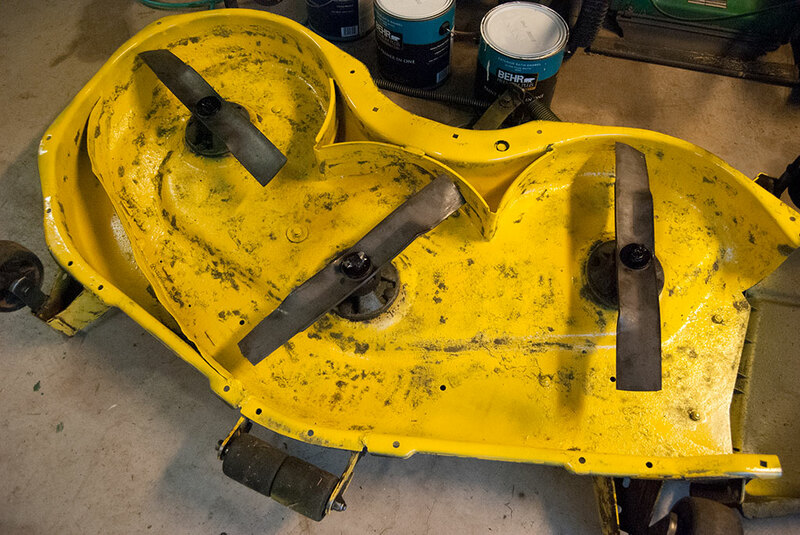 Finally, a dry late summer is upon us, so I managed – after about a week and four tries – the remove the deck from the mower to clean it, repair it, and replace the blades. It turned into an ironic and physically stressful event that involved three of us pulling back a spring to reattach a tension bar, and three others of us trying to remove a stubborn blade bolt, then finally welding a bigger bolt onto it so the three of us could put our strength into removing it. Lastly, we cut off the nut with a grinding tool. The underside of the deck was somewhat rusted in general, so I painted it with some enamel left over from last summer’s painting escapades, then attached the new blades. My right hamstring is sore. Apparently I am right-legged, at least when I do repair work. The fruits of my labor may come about tonight if my repairs were successful and I am able to mow. Or, if I did it all wrong, I may check myself into the yard work insane asylum. After a considerable amount of self-induced frustration, including including looping the engine-to-deck belt around an extra wheel (hard to see in the tangle of belts and gears under the mower), I fired her up and she mowed well. My right hamstring, on the other hand, is quite sore from the work. Why is my mower named “Wildfire”? Find out here (link)! 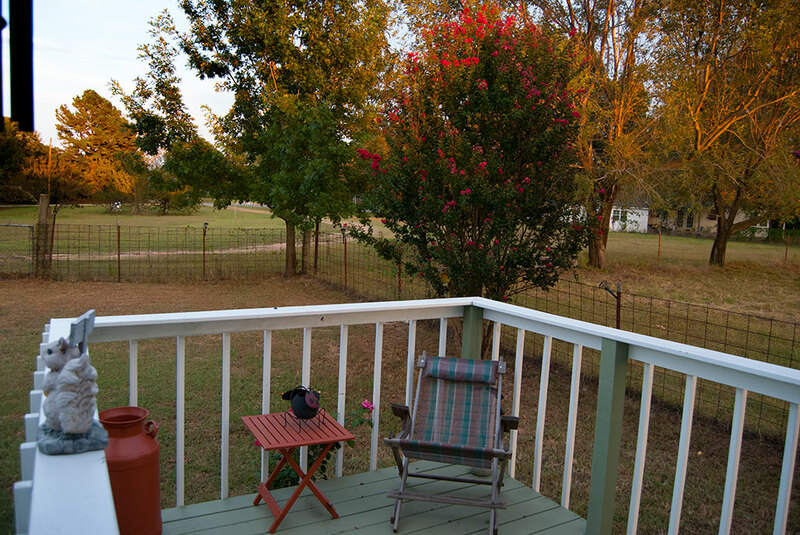 In the midst of this stressful work, I took note the the porch and front yard looked amazing at sunset. As usual, your commitment to mowing is both admirable and awe-inspiring, as I would personally never want that much work. 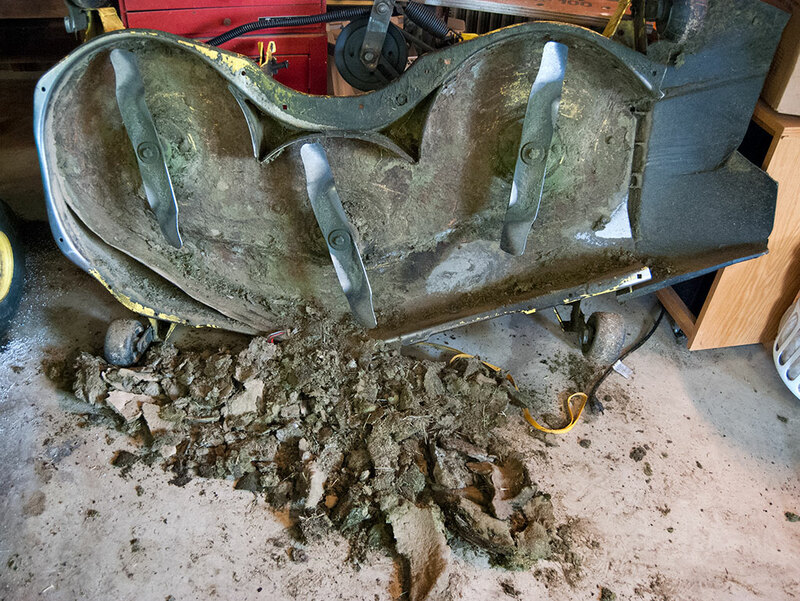 I had to reattach the blade of my push mower last week as it just, quite simple, FELL OFF during operation, and it was such a hassle that I checked myself into the nearest recliner for three days. By the way, I feel an explosion of movie reviews coming on. Will post to me blog. Can’t wait till I have a yard big enough to require a riding mower.